I often view mushrooms in the same light as potatoes – delicious, but not at the top of the nutrition content totem pole. But that view is actually incorrect. Despite their colorless appearance, white mushrooms actually pack some serious nutrition punch. They boast large amounts of copper, phosphorous, B vitamins, antioxidants, and Vitamin D (depending on how they were grown). Those nutrients are involved in a whole host of jobs in your body, including energy production, liver function, bone health, and DNA repair. 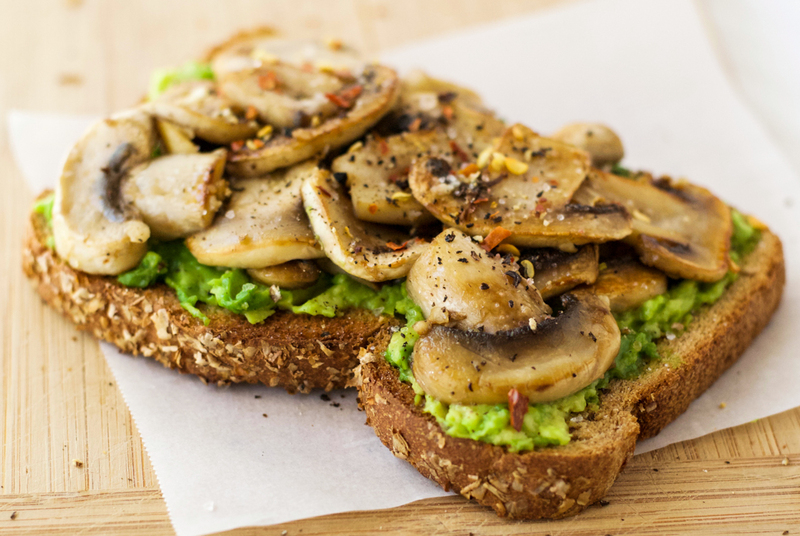 So this garlic mushroom avocado toast is a wonderfully nutritious lunch option. 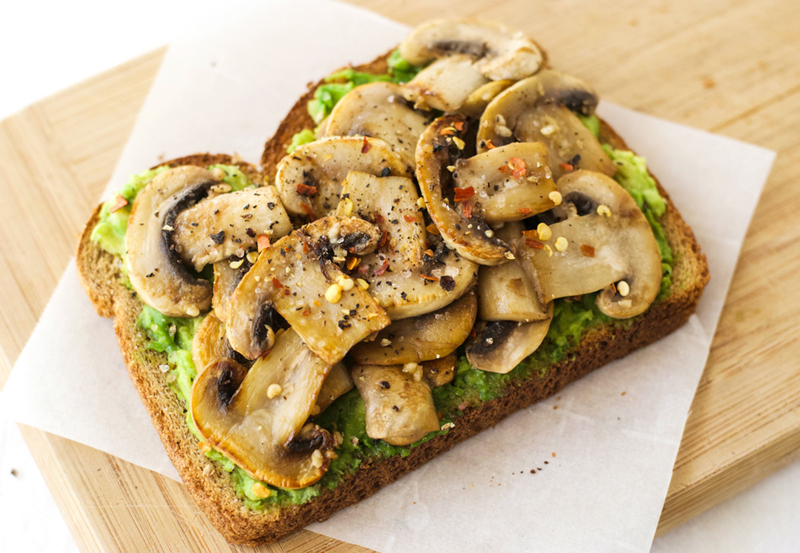 One serving of this garlic mushroom avocado toast (two slices) contains 60% of a woman’s and 40% of a man’s daily fiber needs. That alone is impressive given the importance of fiber to digestive health and the fact that most of us do not eat enough. You will also get a whopping 15 grams of protein per serving and a good dose of healthy fats, both sure fire ways to keep you feeling full for longer. 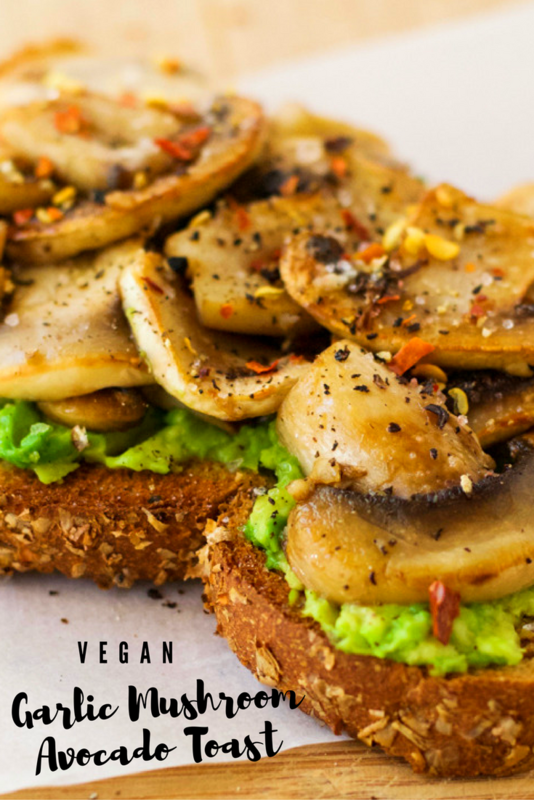 So if you are looking for a tasty, nutritious, and simple lunch, look no further than this vegan garlic mushroom avocado toast. Heat the olive oil in a skillet (frying pan) over a medium high heat. Add the mushrooms and cook until they start to turn golden brown, about 5 minutes, turning them part way through. Add the crushed garlic to the mushrooms, stir to combine, and continue to cook for 1 minute. Remove the mushrooms from the heat. Mash ¼ avocado onto each slice of toast. 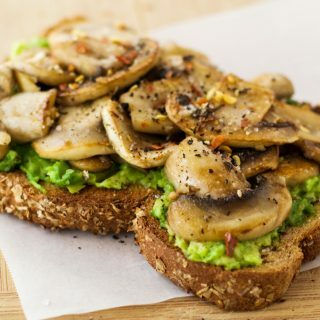 Place ¼ of the cooked mushrooms on top of each slice of avocado toast. Sprinkle with a little salt, some freshly ground black pepper, and a few chili flakes if you like heat.